2926 Adams St in La Crescenta is located above Foothill Blvd, next to Two Strike Park. This is a very private three bedroom, 1.5 bathroom home in La Crescenta CA. This great home is listed for $549,950. It’s in a wonderful neighborhood, near award winning schools and more. 3653 Fifth Ave in La Crescenta CA is located below Foothill Blvd, close to Dunsmore Park and award winning schools. This 3 bedroom, 1 3/4 bathroom home has new landscaping, central heat and air and is located in a wonderful neighborhood. Offered at $569,000. 2328 Chapman Rd in La Crescenta is in prestigious Briggs Terrace, close to Two Strike Park. Chapman Road is a private street in La Crescenta and part of it is gated. This custom built, 2 bedroom home is in the gated portion andfeatures a pool, lovely gardens and more for $875,000. 2542 Olive Ave in La Crescenta CA is located in a quiet private street far above Foothill Blvd. Nestled against the San Gabriel Mountains this home is close to Goss Canyon and Pickens Canyon with many hiking trails into the mountains. Two Strike Park and great schools are also nearby. What a great area! This 3 bedroom home is listed at $499,900. For additional info on any of these homes just click the link! 3571 Emanuel Dr is located in the Oakmont Woods neighborhood of Glendale. A three bedroom, three bathroom home for only $847,000! Oakmont Woods is a great little area of cul de sacs nestled into the Verdugo Hills. Emanuel Drive is located at the top of the neighborhood and many of the homes on Emanuel have wonderful views of the Crescenta Valley. One of La Crescenta’s big attractions is the natural beauty of the area. Another is the award winning La Crescenta schools. 3702 Los Olivos Ln in La Crescenta, located above Foothill Blvd next to Dunsmore Park. The two bedroom house is located close to public and private schools and features lovely mountain views for $495,500. This cutie is already sold! 2306 Blanchard Dr in Glendale, minutes from Verdugo Park is surrounded by great hiking on the nearby mountain trails. Blanchard Drive is a pleasant tree-lined road and 2306 Blanchard Drive, with amazing curb appeal is listed for $1,295,000. 3465 Downing Ave is a two bedroom home in the Sparr Heights neighborhood of Glendale. Sparr Heights is adjacent to the Montrose shopping area, with it’s charming shops and restaurants. A real pleasure to stroll through this neighborhood – it gets top ratings from everyone in the area. This Spanish-style, handyman’s delight is listed at $609,000. 3653 Fifth Ave in La Crescenta is located between Crescenta Valley park and Dunsmore park. A three bedroom, two bathroom home for only $569,000. This tree-shaded home is within the award winning La Crescenta school district and in a great neighborhood. 3501 Paraiso Way in La Crescenta is in a great neighborhood, above Foothill Blvd and very close to Dunsmore Park. This area is serviced by award winning schools and is a great place to live. The home is 4 bedrooms and 2 bathrooms – listed for $719,000. 3057 Alabama St in La Crescenta is also in an excellent neighborhood, also above Foothill Blvd on a quiet street. The home has 3 bedrooms and 2 bathrooms. It is listed at only $599,999. As Ben Franklin said, “It’s an ill wind that blows no one good…”. Certainly, the current real estate woes are an ill wind for a homeowner who needs to sell. So, who get’s to take advantage of this “ill-wind’? The “Move Down Buyer”. First off: What/Who is a “Move Down Buyer”? Long time owner with equity. Usually over 55 years (I’ll explain why). Wants to bank some tax-free money. By selling the current, larger, home now, you will “lock in” more equity. 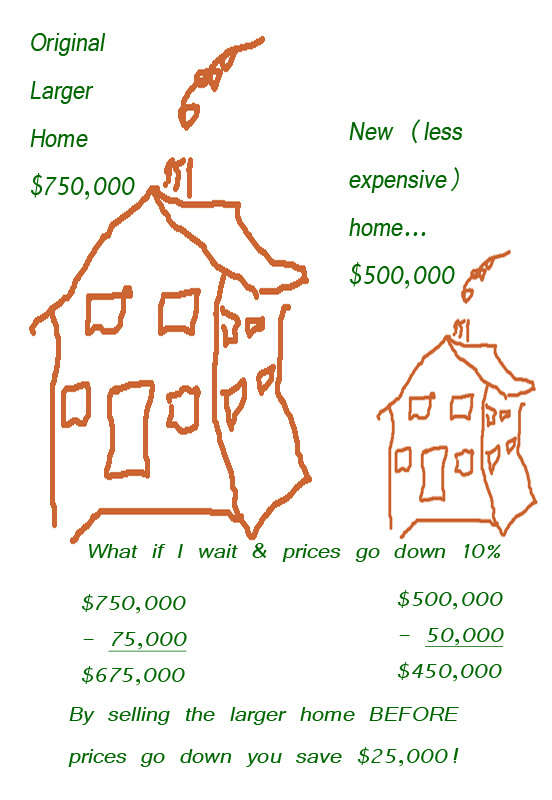 If your old house & your new, less expensive, house both go down 10% you get to pocket some of the money. An example follows. If either spouse is over age 55 (when the old home is sold), PROP 60 allows replacement of a primary residence with a new home of equal or lesser value (but see below) within the same California county and transfer of the Prop 13 assessed valuation from the old home to the new property. Let’s say you paid $130,000 for your current, larger home many years ago. Your property tax might be $1,500 to $2,000 per year. Most people who pay $500,000 for a home pay about $6,250 or about $4,000 more in property taxes per year. Proposition 60 lets you keep your old property tax and transfer it to the New, easier & cheaper to maintain home. Or, in the example, a savings of about $4,000 year. So, in this example the homeowner stands to save $25,000 in lost equity, bank up to $500,000 in tax free money, save around $4,000 in property taxes and have a less expensive, easier to maintain home. (and getting vexed(er)). This “big box” store will change the charater of the area. In which case Home Depot will be coming and Sunland will be going (to pot? ).Homeowners feel that almost any general merchandise store – think Target or similar – is the way to go. will be held on Saturday, April 26 from 1 till 4 pm at Mt. Gleason School!